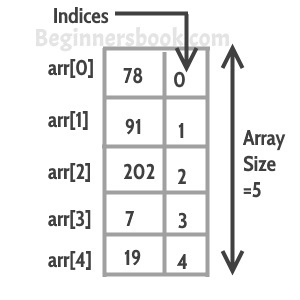 An array is a collection of similar items stored in contiguous memory locations. In programming, sometimes a simple variable is not enough to hold all the data. For example, lets say we want to store the marks of 500 students, having 500 different variables for this task is not feasible, we can define an array with size 500 that can hold the marks of all students. There are couple of ways to declare an array.